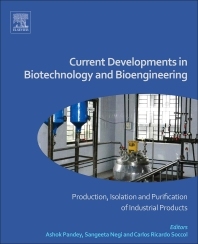 Current Developments in Biotechnology and Bioengineering: Production, Isolation and Purification of Industrial Products provides extensive coverage of new developments, state-of-the-art technologies, and potential future trends, focusing on industrial biotechnology and bioengineering practices for the production of industrial products, such as enzymes, organic acids, biopolymers, and biosurfactants, and the processes for isolating and purifying them from a production medium. During the last few years, the tools of molecular biology and genetic and metabolic engineering have rendered tremendous improvements in the production of industrial products by fermentation. Structured by industrial product classifications, this book provides an overview of the current practice, status, and future potential for the production of these agents, along with reviews of the industrial scenario relating to their production. Dr Sangeeta Negi is Assistant Professor in the Department of Biotechnology at the Motilal Nehru National Institute of Technology, India. She has a first class Master’s degree in Biochemistry and a PhD in Biotechnology from the Indian Institute of Technology, Kharagpur. She has also worked as an academic guest at the Biological Engineering Department; Polytech Clermont-Ferrand; Universite Baise Pascal, France; and at the Bioenergy and Energy Planning Research Group (BPE); Swiss Federal Institute of Technology, Lausanne (EPFL) Switzerland. Dr Negi’s current research interests are in the area of biofuels, industrial enzymes, and bioremediation. She is an editorial board member of the Journal of Waste Conversion, Bioproducts and Biotechnology, and Journal of Environmental Science and Sustainability. She has been awarded as "Outstanding reviewer" by Elsevier and has won the Young Scientist Award by DST at the National Seminar on Biological and Alternative Energies Present and Future organized by Andhra University, Visakhapatnam in 2009. She has also won Best Poster Award at the International Congress on Bioprocesses in Food Industries (ICBF 2008) at Hyderabad. Dr Negi has contributed to nearly 50 publications, including review articles, original papers, and conference communications. Professor Carlos Ricardo Soccol is the research group leader of DEBB (Department of Bioprocess Engineering and Biotechnology) at the Federal University of Paraná, Brazil, with twenty years of experience in biotechnological research and development of bioprocesses with industrial application. He is graduated in Chemical Engineering (UFPR, 1979), Master in Food Technology (UFPR, 1986) and Ph.D. in Genie Enzymatique, Microbiologie et Bioconversion (Université de Technologie de Compiègne,- France, 1992). Postdoctor at Institut ORSTOM/IRD (Montpellier, 1994 and 1997) and at the Université de Provence et de la Méditerranée (Marseille, 2000). He is HDR Professor at Ecole d'Ingénieurs Supériure of Luminy, Marseille-France. He has experience in the areas of Science and Food Technology, with emphasis on Agro-industrial and Agroalimentary Biotechnology, acting in the following areas: bioprocess engineering and solid state fermentation, submerged fermentation, bioseparations, industrial bioprocesses, enzyme technology, tissue culture, bio-industrial projects and bioproduction. He is currently Coordinator of Master BIODEV-UNESCO, Associate Editor of five international journals and Editor in Chief of Brazilian Archives of Biology and Technology Journal. Professor Soccol received several national and international awards which include Science & Technology award of the Govt. of Paraná (1996), Scopus/Elsevier award (2009), Dr. Honoris Causa, University Blaise Pascal-France (2010), Outstanding Scientist – 5th International Conference on Industrial Bioprocesses, Taipei, Taiwan (2012), Elected Titular Member of the Brazilian Academy of Sciences (2014). He is a technical and scientific consultant of several companies, agencies and scientific journals in Brazil and abroad. He has supervised and formed 96 Master Science students, 48 PhD students and 14 Post-Doctorate Students. He has 995 publications/communications which include 17 books, 107 book chapters, 270 original research papers, 557 research communications in international and national conferences and has registered 44 patents. His research articles until the moment were cited (Scopus DataBase) 5600 Times with Index h=36. current developments in biotechnology and bioengineering, ed by Pandey et al. The topics covered are presented in detail. However, it is not clear whether it is a single volume or a volume of a book series. The volume is very selective and important products of industrial biotechnology are not covered, for example in Part 3, polysaccharides, missing a section on xanthan. If it is not a book series but a single volume, important topics are still missing: The production of amino acids (lysine and glutamate), vitamins (B2 and C), antibiotics (penicillin, cephalosporin, tetracycline), new product classes (biosurfactants) or current trends in electrobiotechnology as well as biological wastewater and exhaust air treatment.